Angelo Merendino/Getty ImagesHillary Clinton speaking in Ohio in June. Hillary Clinton made an impassioned gun control plea Monday, one day after a terrorist shot 49 people dead and wounded scores more at an LGBTQ nightclub in Orlando. In what was billed as a major national security speech, the presumptive Democratic nominee reiterated her call for greater background check measures on gun purchasers and a ban on AR-15-style rifles. Clinton contended that both measures could help lower the number of mass shooting deaths in the US. The former secretary of state also voiced support for Congressional Democrats’ bill that would prohibit individuals on the FBI’s terrorist watch list from purchasing a firearm. Republicans have argued that prohibiting people on the watch list from purchasing a gun violates the Second Amendment, since individuals on the watch list have not been convicted of any wrongdoing. “If the FBI is watching you for suspected terrorist links, you should not be able to buy a gun with no questions asked. And you shouldn’t be able to exploit loopholes or evade criminal background checks by buying online or at a gun show,” Clinton said. 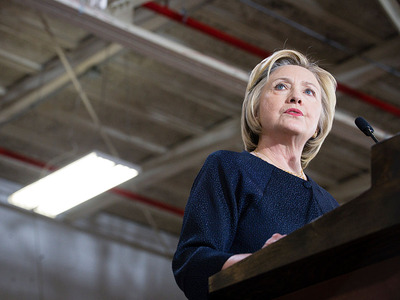 Despite criticism from the left during her 2008 run for being too conservative on gun control measures, throughout the 2016 campaign Clinton has repeatedly made gun control a central part of her pitch to Democratic primary voters. In the lead-up to several key primary contests, Clinton and her allies repeatedly knocked Democratic presidential rival Sen. Bernie Sanders over his more mixed record on gun control issues.